Instagram Stories Now up to 250 Million Daily Users, Increasing Pressure on Snap Inc.
Facebook's assault on Snapchat continues. This week, Facebook has announced that Instagram Stories is now being used by more than 250 million people every day, far eclipsing Snapchat, which has 166 million total users. The data also indicates that the Stories format is growing in popularity on Instagram - as noted by TechCrunch, Stories' growth rate is actually picking up speed, "adding the latest 50 million users in 2 months compared to 3 months for the previous 50 million". In addition to this, a higher percentage of Instagram users are engaging with Stories on their platform - according to their S-1 documentation, Snapchat's says that 25% of their daily users are actively creating their own Stories content, which was similar to Instagram's Stories usage levels back in January, when they reported that 150 million of their 600 million total users were using Stories every day. But now Instagram has 700 million total users, with 250 million engaging with Stories daily - more than 35% of their active audience. The comparison is not exactly direct - Snapchat says 25% are 'creating' Stories content, while Instagram says 35% are 'using' Stories. But still, it paints a more flattering picture of Instagram Stories usage. However you look at it, Instagram appears to be winning the social stories race - this chart from Recode underlines the situation. The news is not good for Snap Inc., and the market responded as you would expect. While Snapchat started the stories trend, Instagram is now taking over, which is putting increased pressure on Snap to come up with new ways to generate interest and shift the market narrative away from audience size. 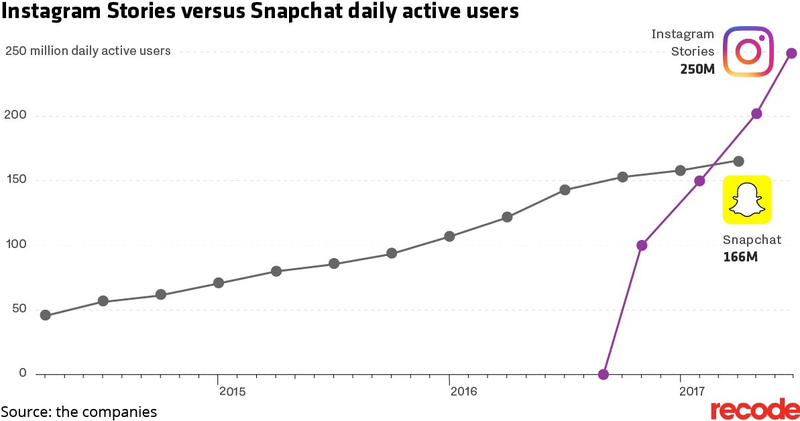 Thus far, Snap Inc.'s strategy has focused on engagement over users - 'we may have fewer people on our platform, but they're far more engaged and locked in'. And going on available evidence, that may be true - Snap Inc. noted during their first earnings call that users are now active in Snapchat for over 30 minutes per day, which was up from the '25 to 30 minutes' stat it listed in its initial IPO documentation, and could theoretically be higher than Facebook (Facebook noted last April that people are now spending more than 50 minutes per day, on average, using Facebook, Instagram and Messenger, though there was no breakdown of single app specifics). 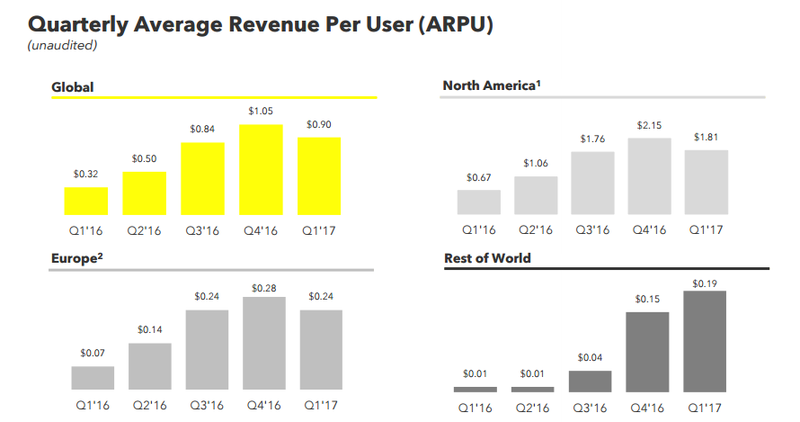 But in order to reinforce that message, Snap Inc. needs to show significant gains in average revenue per user, reflecting that they can actively monetize that engagement. This wasn't yet evident in their first results. But really, such speculation is higher level analysis, what brands really need to know is whether they should spend more time building their presence on Snapchat or Instagram. Is it worth developing a Stories strategy on one or the other - or both? The truth here is 'it depends'. It depends on where your specific audience is spending their time, it depends on the response you're seeing on each - there's no generic answer as to which stories offering is going to produce better results for your brand, specifically. "...a third (of the most viewed stories) are businesses using Instagram Stories and one million are advertisers." Clearly, Instagram Stories are proving popular for both individual users and businesses, but Snapchat is still generating good results for the brands that have taken the time to learn the platform. When you're talking in such large numbers, it's easy to lose perspective, but 166 million people is still a lot, and the younger skew of Snapchat's audience still holds much appeal. The broader concern is what this means for Snapchat in the longer term - if Instagram continues to heap the pressure on, will Snap Inc. be able to survive? As we've speculated previously, one way that Snapchat may be able to get ahead is by putting more focus on their other product offering, Spectacles. Snap Inc. has worked to re-frame itself as a camera company - maybe by actually focusing on the camera element, and building a new, AR enabled version of Spectacles, they might be able to get out of Facebook's way and forge their own path in another direction. Recent reports have indicated that Snap Inc. is working on Spectacles 2.0, while they've also expanded the availability of Spectacles into Europe. Of course, Facebook is considering their own version of augmented reality wearables too, but they still seem a long way off (Zuckerberg recently noted that we're about 5-7 years away from an effective iteration of AR glasses). If Snap can get the jump on this, it could help them branch out and re-ignite their growth, and boost Snapchat itself as a complimentary platform. It's impossible to know Snapchat's full plans, but Instagram's latest numbers further increase the pressure on Evan Spiegel and Co.
Now we await their next response.